Prince William is a huge soccer fan who arranged for a special game to be played at Buckingham Palace as part of the English Football Association's 150th birthday. Preparations for the game Monday started weeks ago. It will be the first time -- and maybe last -- that an official match takes place at the Queen's London residence. The Queen isn't expected to be in attendance when amateur teams Civil Service and Polytechnic play. She is, incidentally, said to be a fan of London club West Ham. It won't be the first time a sporting event is played at Buckingham Palace. John McEnroe and Bjorn Borg were the star attractions at a charity tennis tournament in 2000. 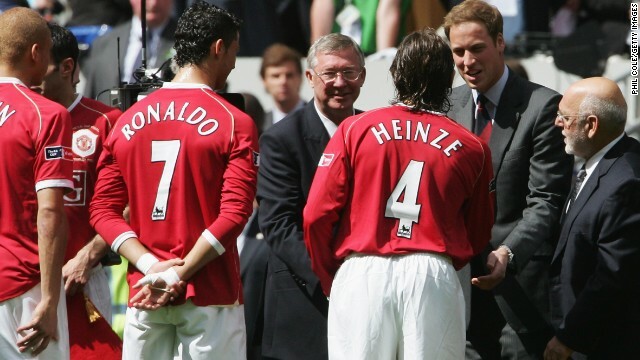 As president of the FA, Prince William intermittently attends big matches. 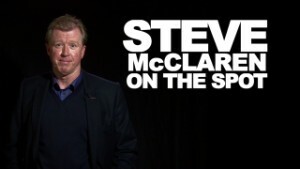 He was at Wembley for the FA Cup final in 2007 between Manchester United and Chelsea. 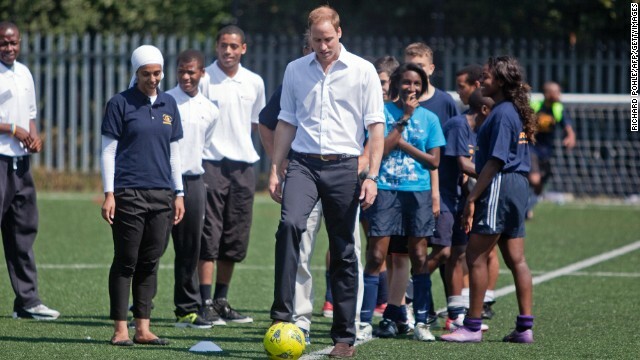 Although he supports Birmingham's Aston Villa, Prince William trained with London club Charlton in 2005. 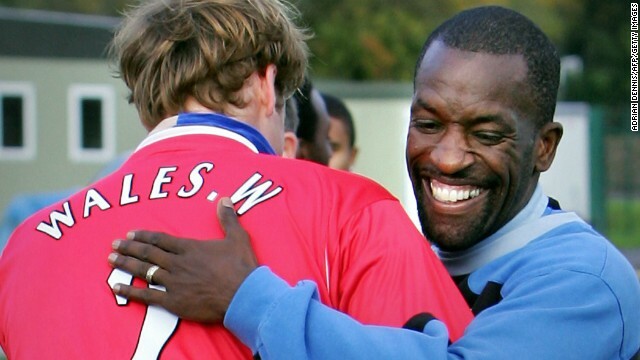 He got a hug from Chris Powell, a former member of England's national team and a Charlton legend. 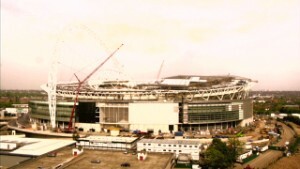 (CNN) -- When it comes to soccer's most hallowed grounds, London's Wembley and Rio's Maracana are two that spring to mind. They are steeped in history, having staged World Cup finals. Other revered stadiums include Barcelona's Nou Camp, Real Madrid's Bernabeu, Manchester United's Old Trafford and the San Siro, shared by AC Milan and Inter Milan. But a venue that has never housed a game could trump those arenas, if only for a day: Buckingham Palace. Queen Elizabeth's London residence will host its first and perhaps last official soccer match Monday as part of the English Football Association's 150th anniversary celebrations when amateur clubs Civil Service FC and Polytechnic meet. None other than Howard Webb, who refereed the 2010 World Cup final, will be the official in charge. Prince William arranged the game, and on the day 150 grassroots soccer volunteers will also be given medals by the Queen's grandson, who happens to be president of the FA and an Aston Villa supporter. The Southern Amateur League sides found out last month they'd be lining up at Buckingham Palace and the buzz quickly grew. "We all agreed that this was much better than playing at Wembley and is something we will be able to tell our grandchildren," Polytechnic manager Geoff Brown told CNN. Civil Service's standout midfielder Ryan Cameron used to play professionally for East Fife in Scotland and even had the chance to take on his preferred team, Rangers. But the 38-year-old knows this is a "once in a lifetime" opportunity. That said, Cameron initially forgot to tell his wife about the game. "It slipped my mind," Cameron, employed in the IT sector in the English capital, told CNN. She only learned of Civil Service's involvement by watching the news while working out. "I think there was an understanding that the game would be played in London," Cameron said. 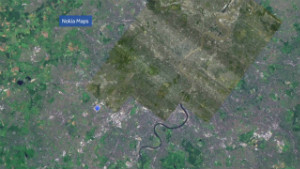 "Most of the lads just automatically assumed it would be at one of the Premier League pitches because there's already a pitch there. "To find out that it was going to be at the Palace and that they were going to put a pitch in the gardens, it was something that took us by surprise." Cameron won't be star struck when he meets the Prince, having run into him at a bar when he returned to St. Andrews -- the Prince graduated from the university in 2005 -- to play in an alumni game. The Queen isn't expected to be in attendance, the Buckingham Palace press office said. Guests from both teams will be there but members of the general public won't be allowed in. How were the teams chosen? Civil Service is the sole surviving club from 11 "that met to create the FA in 1863," the FA said on its website, and as such is celebrating its 150th anniversary, too. In its heyday in the early 1900s, Civil Service would regularly beat the likes of Real Madrid and Barcelona on European tours, said team vice-president Neil Ward. Polytechnic was formed in 1875 and is Civil Service's arch-rival, with the clubs separated by about a mile in west London. "I believe we first played Civil Service in 1893," Polytechnic chairman Barry Madigan told CNN. "We're very near neighbors." But just as important, Civil Service was due to face Polytechnic in the round of games taking place this weekend, said Ward. Officials then asked Civil Service if they could move the game from a Saturday to a Monday to accommodate the Palace. "The only thing is that all the lads have to take time off," said Ward, a 60-year-old Everton fan. "At that stage I couldn't tell them why we were moving the game. "Suddenly the players and officials have a chance to make their own history and join their predecessors." 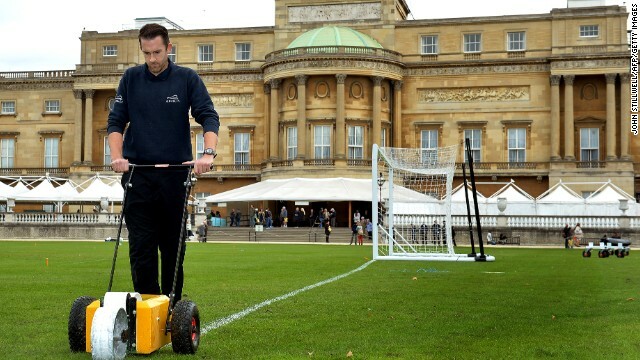 Wembley groundsman Tony Stones will combine with the Palace's gardeners to get the pitch ready, the FA said. 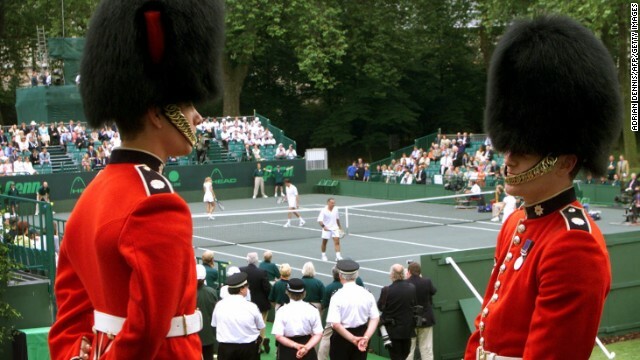 It won't be the first time a sporting event has been played at the British institution and tourist hotspot -- a charity tennis event featuring John McEnroe and Bjorn Borg was held in 2000. With a day to go before the game, don't be surprised if several of the players expected to participate take it easy in training to avoid getting hurt and missing what could be classified as their biggest Cup final. "The potential inevitability might be not wanting to get injured, and there are players on the periphery definitely wanting to try to force their way into the team," said Cameron. "But I think that can only be good for the squad. "We realize it's a special fixture but we can't get carried away and that's why we have to train hard, take it like any other game. 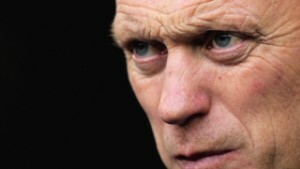 I'm sounding like a Premier League manager but it's absolutely true." It won't be like any other game, though.